Keywords:Inhumanity, retreat, kindness, consideration, compassion, exercise, recreation, employment, work, moral treatment, children, family, social, domestic, religious sentiment. Daniel Hack Tuke (1827-95) was the great-grandson of William Tuke (1732-1822), the founder of the York Retreat. In this excerpt, taken from V. Skultans (ed. 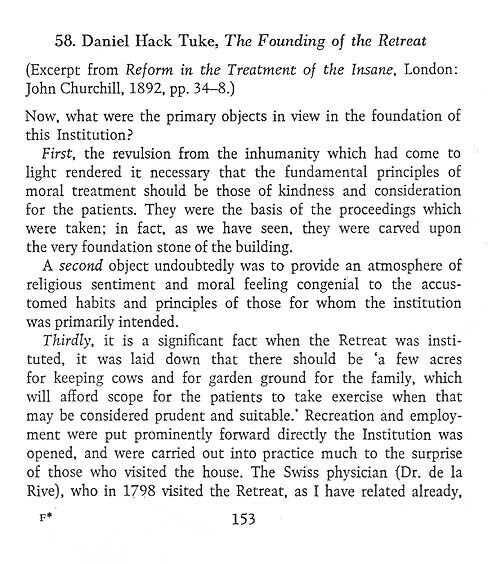 ), Madness and Morals: Ideas on Insanity in the Nineteenth Century (London, 1975), the physician (and specialist in lunacy) sets out the key philosophies of the Retreat and in doing so, succinctly describes the central components of moral therapy as it was originally envisaged in the late-eighteenth century. His text is useful for its provision of clear overview of reform in the treatment of lunacy.